Not too long ago I tweeted and facebook-ed about the latest jewelry design that I made & I am so excited about it, and here it is!!! I LOVE it! I do believe it is my best design yet. 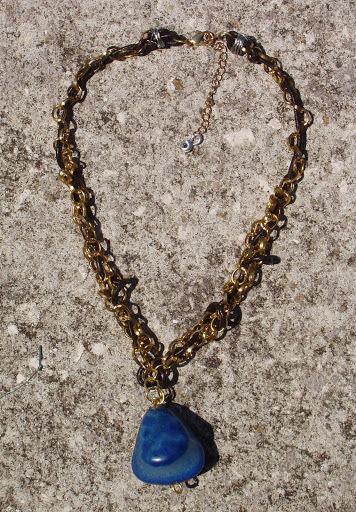 It is made with gold-tone chain and thin leather cord that is intertwined together and is topped off with a large cobalt agate chunk that I made into a pendant. I know this necklace will be a summer staple in my closet and I find the subtle statement it makes, oh so appealing. I love how it looks in the previous post with the white and cream. What are your go to summer jewelz? p.s. Don’t forget to check out the Vedette Shapewear giveaway! This entry was posted in Design and tagged accessory, design, handmade, jewelry. Bookmark the permalink. LOOOOVE this! Great blog! Love the outfit choices! Wow how beautiful this is going to look incredible on you! plus so in for fall (exposed rocks) LOVE IT. OOO I love it. Its so pretty darling! That necklace is sooo pretty! I can't believe you made it yourself. It's going to look gorgeous on you! Laura, you have such an eye for detail! this necklace is so awesome! i can't wait to see more jewelery made by you. Omigosh, why I am not on your twitter?! Well that's kind of silly. Aren´t you clever??? It is fantastic!! !